Division 2(N) and Division 2(S) of the Tohoku League is getting underway now, with several matches taking place over the weekend. 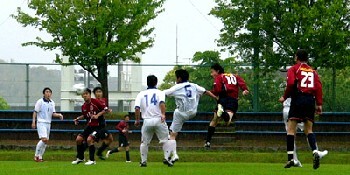 In the northern section, Mizusawa United Club overcame Aster Aomori 3-0 in the opening game of the season for both sides. Most teams in the southern division, meanwhile, have two matches under their belts, Marisol Matsushima and Northern Peaks Koriyama having won both. Of the newly promoted teams, Shichigahama SC are mid-table following their defeat by Northern Peaks, but FC Perada Fukushima have yet to pick up a point and are bottom of the division at this early stage. There's an astonishing gap emerging between the top and bottom halves of the Shikoku League with nine points already between Sanyo Electric Tokushima in fourth and Sanwa Club just a place behind them. And what this means is that any slip is potentially magnified many times over when it comes to the league standings, as Sanyo discovered when a disappointing 0-0 draw at Alex SC meant they dropped two places. Nangoku Kochi's 8-1 thrashing of Ventana AC has pushed the title holders up to second on goal difference, with Ehime Shimanami third. Still in the lead, however, and now with twelve points out of twelve, are Kagawa prefecture's Kamatamare Sanuki, who put five without reply past Tokushima Vortis Amateur - and who host Nangoku next weekend. Division 1 of the Kanto League has an unexpected look to it four matches into the new season, as the previously underachieving Yaita SC head the ranking thanks to a 2-0 win over the far more established Saitama SC. A point behind them are newly-promoted Toshiba Fuchu, 3-0 winners over Toho Titanium - and in third spot now are the Yokohama Sports and Culture Club, conquerors of reignin champions Luminozo Sayama, who are having a truly disastrous season with just a single win to their name so far. The Hokushinetsu League Division 2 is proving a particularly tight contest this year and in round 4 on Sunday, all but one of the games ended in a draw. 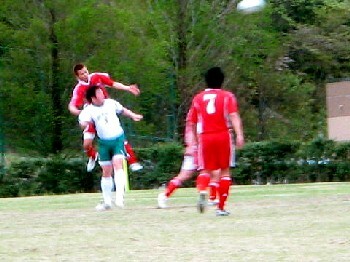 Valiente Toyama were the lucky exceptions, 3-2 winners at Maruoka Phoenix and consequently just one point off the lead. FC Kanazu and TOP Niigata remain undefeated, while Nissei Resin are searching for their first win of the season. One of the most fiercely-contested Regional Leagues is in Hokushinetsu, where Japan Soccer College clung on to top spot in Division One with an injury time equaliser in the eagerly-awaited match-up with Matsumoto Yamaga Club. 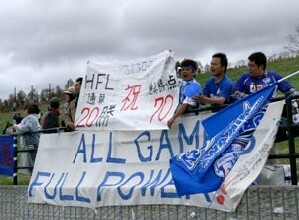 But there are as many as five reasonably realistic title contenders, as Nagano Elsa have recovered from their early season jitters - evidenced by their 7-0 win at Teihens FC - Zweigen Kanazawa scraped a 1-0 victory over Niigata University of Management and even Fervorosa are still in touch. This is definitely one to keep an eye on. 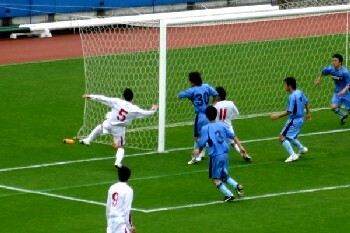 Newly-promoted hopefuls FC Central Chugoku destroyed Chugoku League rivals Fagiano Okayama 5-0 in the most sensational result of the Regional League seasons so far on Sunday, at a stroke casting serious doubt over the viability of Fagiano as promotion contenders and candidates for the JFL. At the top of the division two rounds in are nevertheless experienced outfit Hiroshima Fujita SC , although their 1-0 win over the smalltown Iwami SC means that they have played two of the weaker sides in the league thus far. 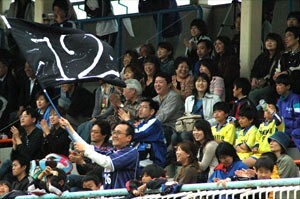 In second place after a 4-1 thrashing of Renofa Yamaguchi are last year's champions Sagawa Kyubin Chugoku - and indeed it is Renofa, established in recent months with the long-term intention of bringing J-League football to their remote prefecture, who now prop up the table after two heavy defeats. Next weekend, however, sees a mouthwatering clash betwen Fujita and FC Central that may go a long way towards deciding the destination of the 2006 title.